Petrol prices were increased by up to 8 paise per litre while diesel rates were slashed by 7-8 paise per litre across four metro cities on Saturday, according to state-run Indian Oil Corporation's official website - iocl.com. Currently, the domestic prices of petrol and diesel vary from state to state, and are reviewed by oil marketing companies such as Indian Oil, Bharat Petroleum and Hindustan Petroleum on a daily basis. Any revisions are implemented at the fuel stations from 6 am. 1. With effect from 6 am on March 16, petrol prices stood at Rs 72.63 per litre in Delhi, Rs. 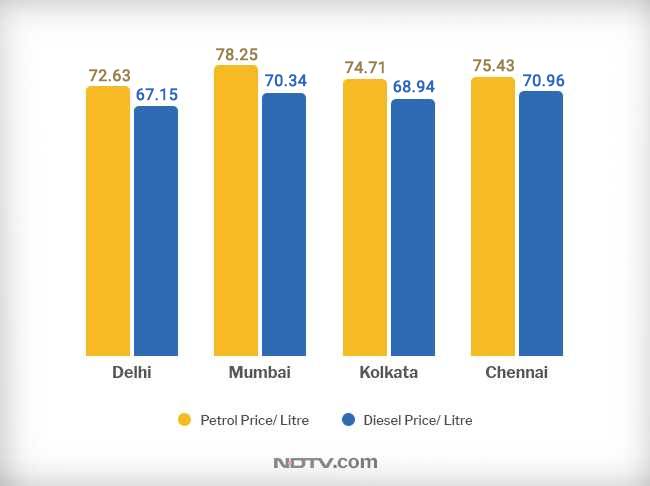 78.25 per litre in Mumbai, Rs 74.71 per litre in Kolkata and Rs. 75.43 per litre in Chennai, according to Indian Oil Corporation. 2. Diesel prices were lowered to Rs. 67.15 per litre, Rs. 70.34 per litre, Rs. 68.94 per litre and Rs 70.96 per litre in Delhi, Mumbai, Kolkata and Chennai respectively on Saturday, according to Indian Oil, the country's largest fuel retailer. 3. As per the country's dynamic pricing mechanism, the domestic fuel prices depend upon international fuel prices on a fifteen-day average and the value of the rupee. This is because a large proportion of country's requirement is met through imports. 4. On Friday, rupee jumped 24 paise to close at 69.10 against the dollar. 5. Globally, US crude futures eased slightly on Friday after hitting a 2019 high, as worries about the global economy and robust US production put a brake on prices. Brent crude futures settled down 7 cents at $67.16 a barrel, below their 2019 peak of $68.14 reached on Thursday, according to news agency Reuters.